Don’t get me wrong, I hack away at pixels like I’m the villain in a horror movie when necessary, but for the record, it’s always better if you don’t. In fact, we’ll talk all about that topic in an upcoming article. Still, sometimes turning a photographic flop into a successful image depends on some well calculated cropping, but just how should you do it? As it turns out, many cameras feature one or more built-in crop modes. For example, my D850 allows me to use the entire frame, a 4:5 ratio, a 1.2X crop mode, a square crop, and a 1.5X crop mode (my favorites are the 1.2X and 1.5X modes). Some cameras may give you even more than that, some don’t give you any choices at all. However, it’s certainly worth exploring your instruction manual to see if the option is there. 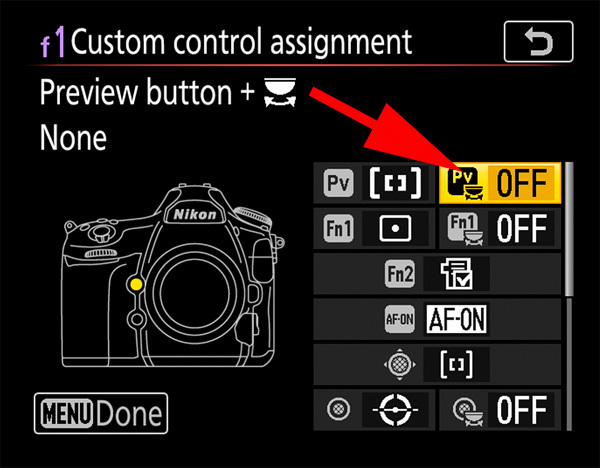 We’ll look at some specific Nikon setup instructions at the end of this article. 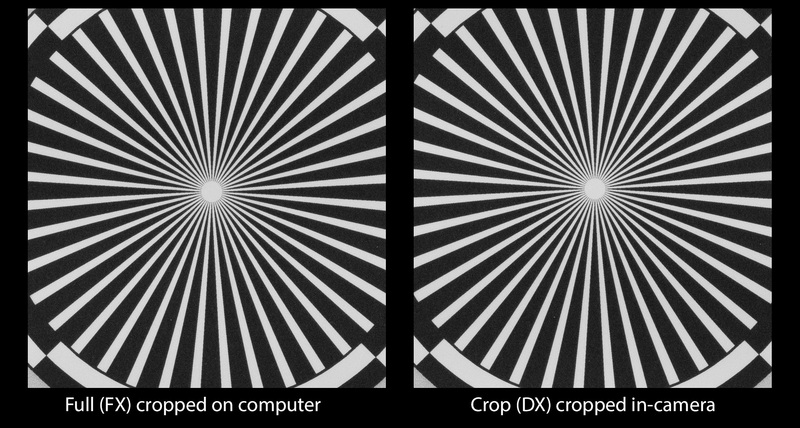 So, let’s examine some aspects of cropping in camera vs. cropping back home. The #1 question I get about crop modes is regarding image quality. Basically, do you get superior quality using the camera’s crop mode(s) or will using the crop tool back home on the computer yield better results? As it turns out, it makes no difference at all. The camera’s crop mode will give you the exact same results as if you had sliced those pixels off from your desk chair. There is absolutely no difference in quality. The camera is merely doing what you’re doing – slashing off extra pixels. McDonald’s didn’t make your camera, so there is no special sauce added to the equation. Additionally, keep in mind that when you crop-in camera (or at home), you are also sacrificing resolution. 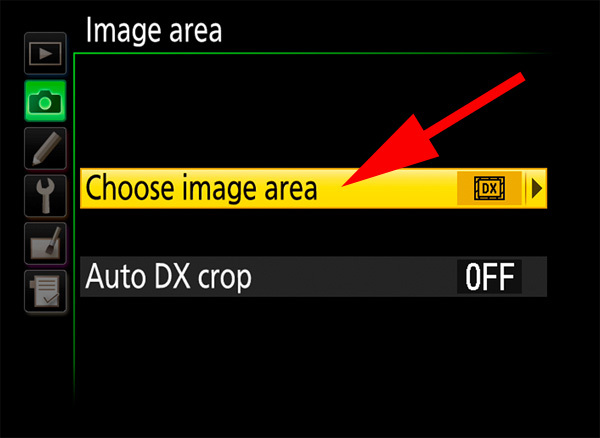 So, if you switch your 46MP D850 into DX crop mode, you’re only capturing 19.4MP of information, not 46MP in a smaller area. For those who would demand proof, here’s an example. I shot the test target using the D850 from the same position, same focus, same exposure – the only difference was I switched to DX crop mode for the shot on the right and cropped the shot on the left using the computer. Of course, this begs the question – if there’s no difference in quality, is there any point to using the camera’s built-in crop modes? 1. Frame Rate – In some bodies with certain crop modes engaged, you may see a boost in frame rate. For instance, with a D810 and D7200, switching to one of the crop modes will net you an extra frame for each second your finger is on the shutter release. A single frame per second may not sound like much, but if you’re an action shooter I don’t need to tell you that sometimes it all comes down to just a single image in a series, so this is a nice bonus. Again, not all cameras will give you that FPS bump (I’m looking at you, D850), but if yours does, that’s a huge bonus. 2. Storage – The next handy side effect you’ll notice when using a crop mode is that your camera can cram more files onto your memory cards. 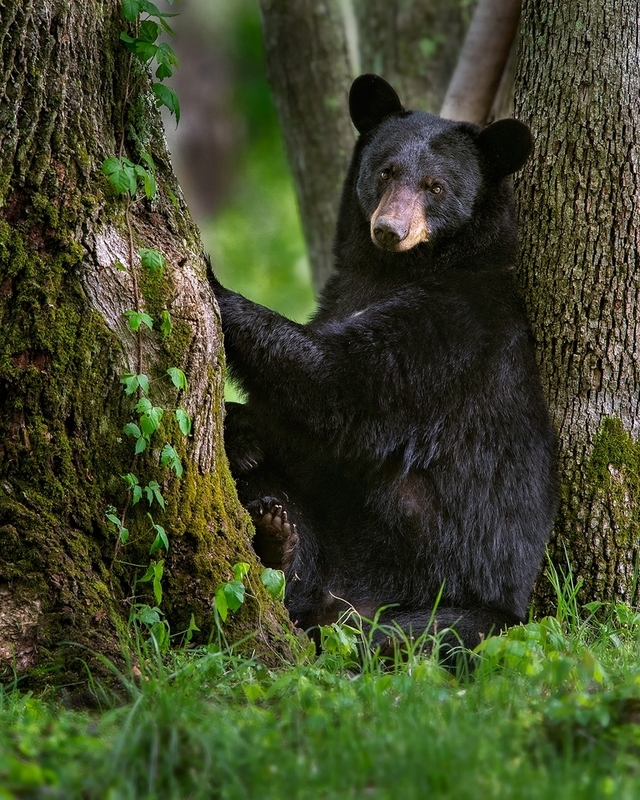 I remember not too long ago I was photographing a mother bear in the Smoky Mountains. She had just opened her eyes after a nice nap and was striking poses like a furry supermodel at her first photo shoot (much to the delight of everyone in attendance). So, of course, I was firing away like I was getting paid by the click and, before I knew it, my first memory card was full of bear pixels with no room to spare. The show wasn’t over and I knew I didn’t have a ton of space on my overflow card. Since I could clearly see I would need to do some cropping at the computer anyway, I decided to put the camera into crop mode and save some space on the card. 3. Buffer Depth – Another practical side effect of shooting in crop mode is you’ll naturally see an increase in your buffer capacity since you’re feeding it smaller files (In crop mode, most DSLRs only capture the area of the image inside the crop, they don’t save the entire image and crop later). So, if your camera is saddled with a limited buffer and you know you’re going to need to crop once you get back home on your computer, why not switch to crop mode in the field? The extra headroom in the buffer may help save the day if you get into an extended sequence. 4.Aspect Ratio – The final benefit of using a crop mode is if you require a certain aspect ratio for your final image. For example, if you specifically want an 8×10 or square print, it’s often easier to just switch to that crop mode in the field. That way, there’s no guesswork and no compositional surprises when you get back home. Since you could see the crop in the field, you can compose the final image properly right on the spot. If I were still shooting portraits, I’d probably use 8×10 crop mode all day long! Of course, there’s no free lunch and there is a downside to cropping in the field – you may end up wishing you still had those lost pixels once you’re back home. In some cases, if you didn’t quite get the composition perfect, you may want a different crop. For example, what if the subject is just too close to one edge of the frame? In those cases, had you shot with the full image area instead of crop mode, you would’ve had plenty of pixels to carve into a beautiful composition back at your desk. Now, you’ll need to trash the photo or attempt a little photoshop magic to save the image. For the photo below, I was in Costa Rica, in a Land Cruiser, shooting over the driver. The truth is, I could have used 1.2X crop mode, but I was in such an awkward position that I could barely see inside the viewfinder. I decided to just pop off the shot and figure out the crop and final composition when I got home! My advice on this is that if you have a static or slowly moving subject, feel free to use crop modes as necessary. However, for faster action where composition might be compromised, stick with the entire image and take an ax to the pixels from behind your mouse. Finally, remember that you should ONLY use one of the camera’s crop modes IF you would have had to crop anyway once you came back home to your computer. (I don’t want someone reading this and then switching permanently to crop mode). 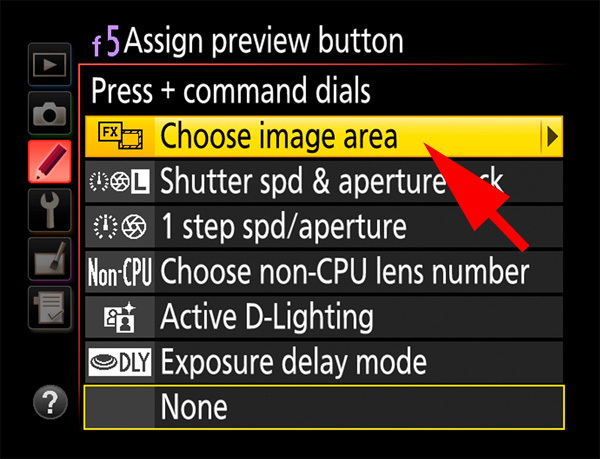 If you’re a Nikon shooter, I have a few setup guidelines that can help you get started using crop modes. 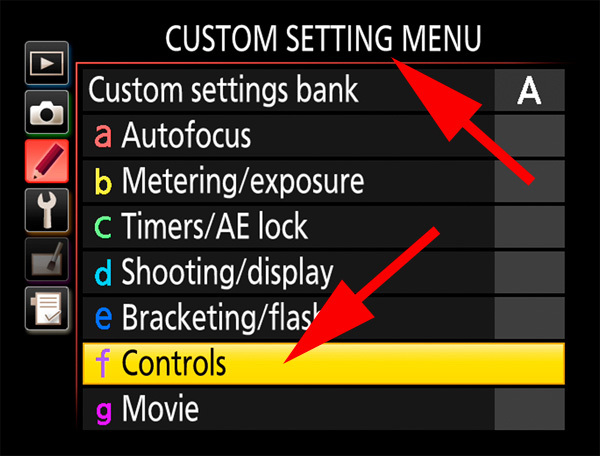 First, let’s look at how to get to your crop modes via your menu system. 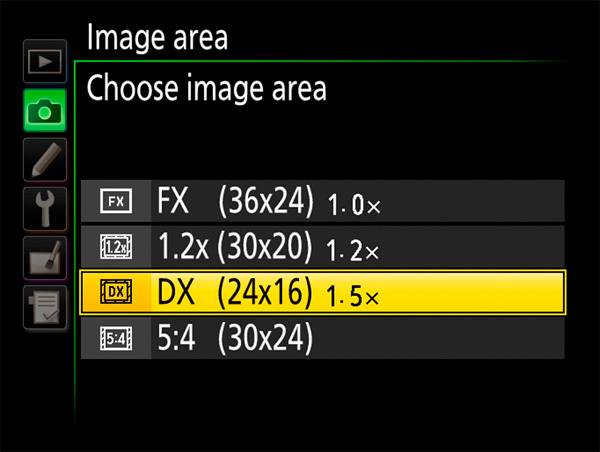 Note that not every Nikon has crop modes (I don’t think the D3xxx or D5xxx series supports them), however every full-frame Nikon supports at least DX crop mode. 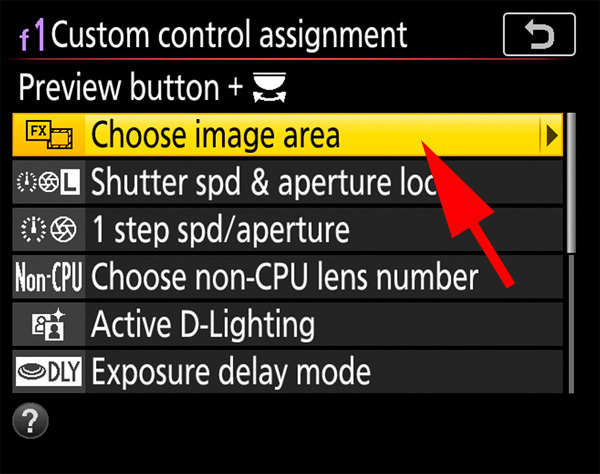 To switch crop modes, press your Menu button and head to the Photo Shooting Menu. Look for an option called Image area as shown below. Give that a press and then select Choose image area from the resulting screen. The next screen will show the options for your camera. 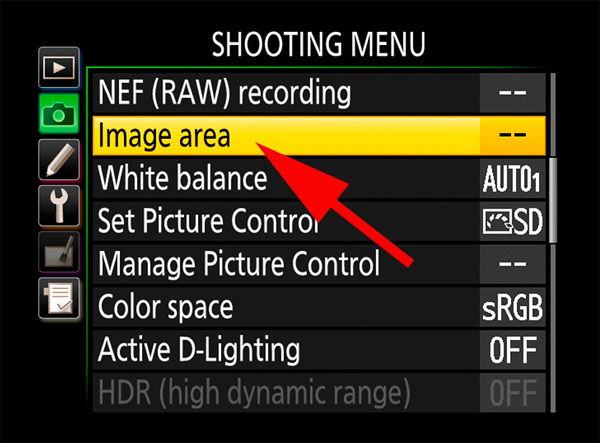 The screen below is from the D810 and shows quite a few options, but the number of options varies by camera. Just pick the one you want and hit OK. If you think you’ll be using crop modes on a regular basis, you may want to assign them to one of your programmable buttons. 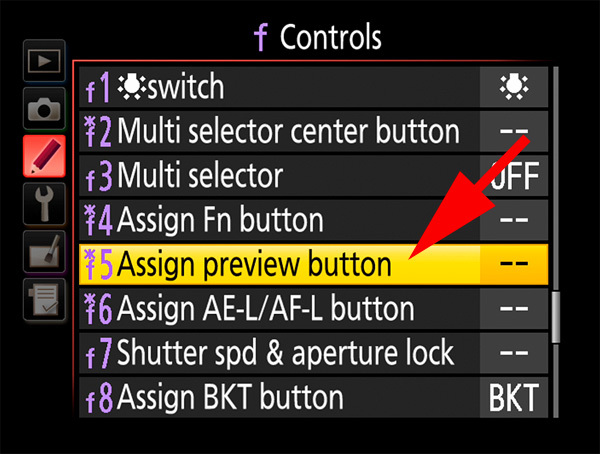 For this example, we’ll program the Preview (Pv) button for switching crop modes, but you can assign most programmable buttons to the task (Fn buttons, AE/AF-L button etc). Once you have this set, you’ll be able to press your assigned button while spinning the command dial to switch crop modes without resorting to menu diving. This is incredibly handy (and quick) if you’re a frequent user of crop modes. Start by heading to the Custom Setting menu, Controls. 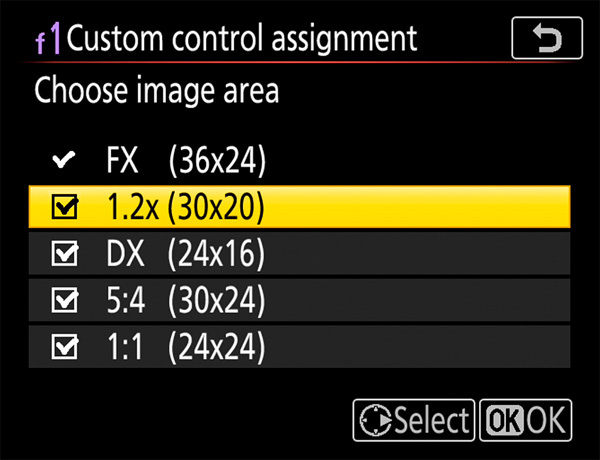 Select Custom control assignment as shown. Since this is used in conjunction with the command dial, you’ll need to select the right-hand column option for your chosen button. In this case, we’ll do the Pv button, but again, please note that you can use most assignable buttons for this. Also note that if you have something assigned to a button press, this will replace that setting. On the next screen, scroll to the option for Choose image area. If you have a DX camera, you’ll simply hit OK and you’re done. For (most) FX cameras, head to the next step. 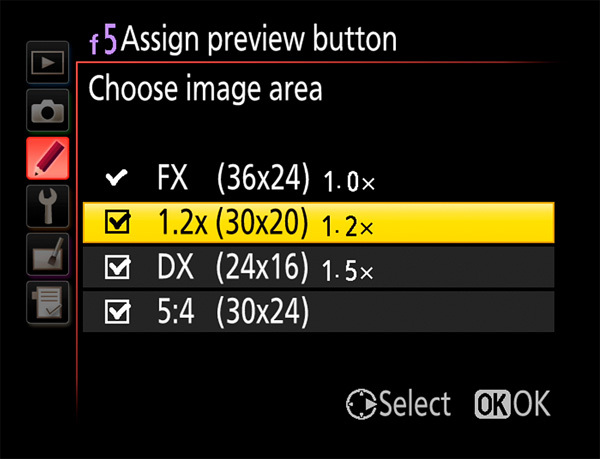 For most FX users, the next screen will allow you to select or de-select any areas you don’t want the camera to use, making the camera skip the crop areas you never use and only scrolling through the ones you do. 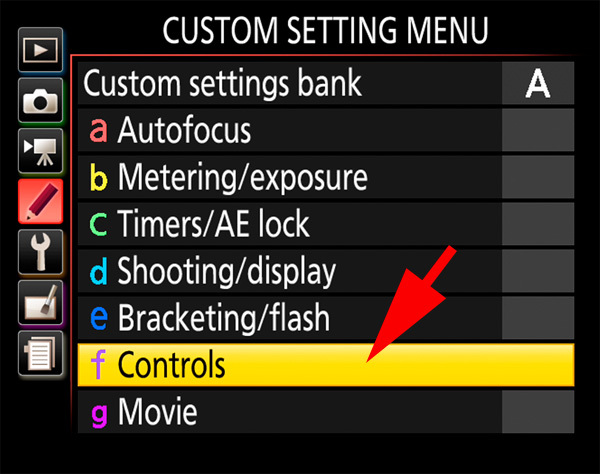 First, head to the Custom Setting menu and select the Controls section. 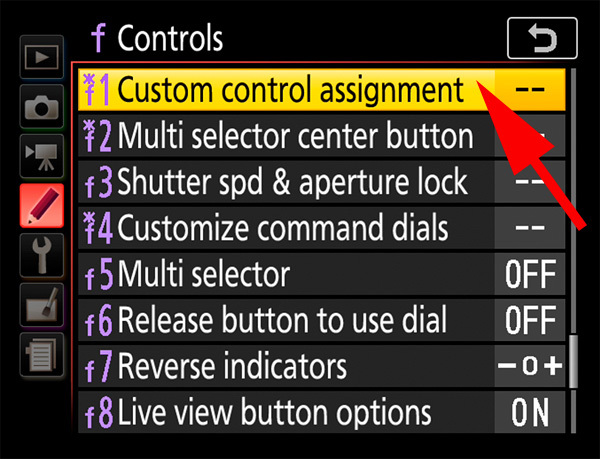 Now, find the button you want to assign for switching crop modes on the resulting screen. In this case I’m using the Preview (Pv) button, but most assignable buttons allow for this feature so choose the one that’s most convenient for you. 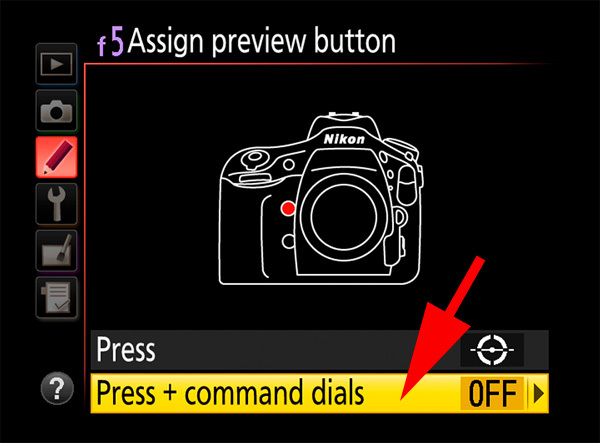 Next, you’ll want to select the option for Press + Command Dials. Note that if you have an option set in for just the “Press” option, doing this will override it. On the next screen, scroll to the option for Choose image area. If you have a DX camera, you’ll simply hit OK and you’re done. For most FX cameras, head to the next step. 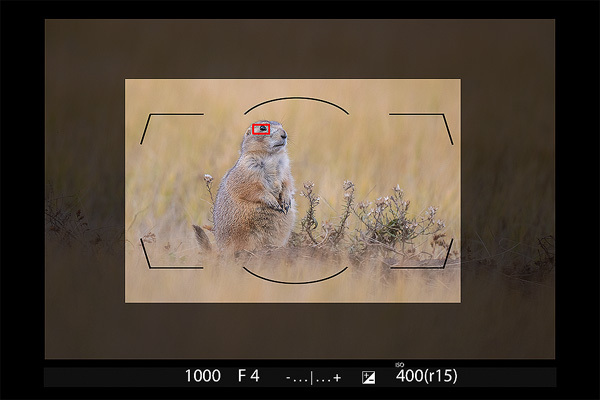 One of the biggest complaints I hear about using crop mode instead of the entire frame is that it’s too hard to pay attention to the little outline that is displayed in the viewfinder, making it far too easy to clip off an antler or a wing inadvertently. Here’s how the crop line looks – kind of busy, right? Well, what if I told you that you can also have a “mask” overlay like this? Sadly, not every camera supports this trick. I know the D800, D810, D850, D6xx, D4, and D5 are all supported. The D7xxx series, D750, and D500 do NOT support masked overlay. Not sure on the rest, if you find one I’m missing, let me know in the comments and I’ll add it. So, how do you turn on masking in supported cameras? Depends on the camera of course. The pro bodies seem to have this as the only option, so D4 and D5 shooters should be good to go out of the gate. For the D850, things are really different (but better), so head past this next little section for the D850 setup. 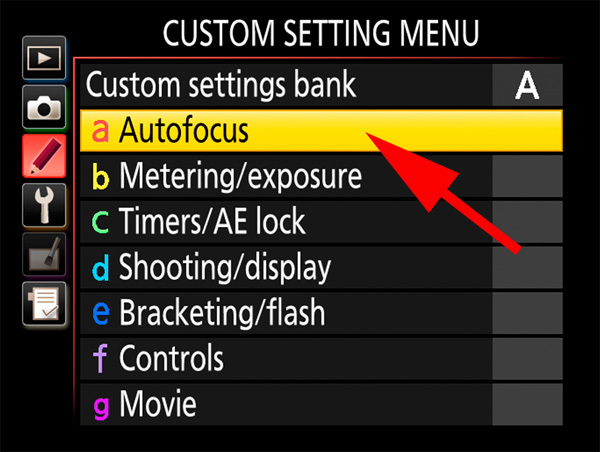 Head to your Custom Setting menu and jump into the Autofocus area. Finally, just shut it off. 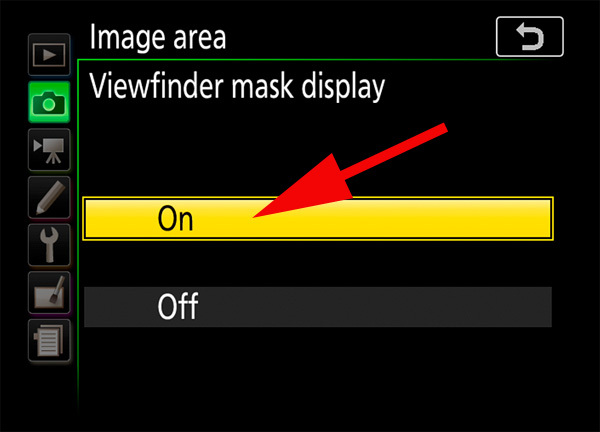 If your camera supports masked display in crop mode, it should be working now. Again, if not, then your camera is not supported. If you have a D850, things are a little different. 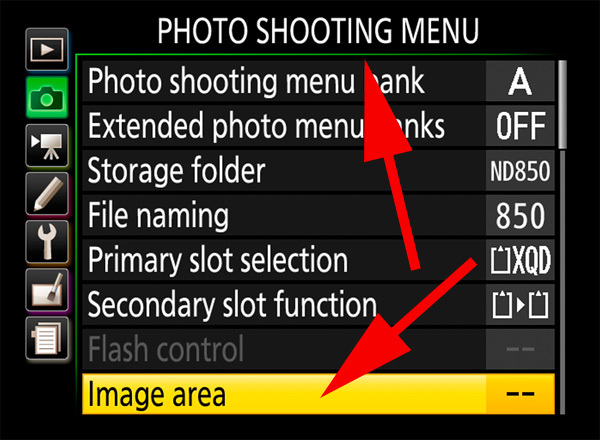 Head to the Photo Shooting Menu and to the Image area option. 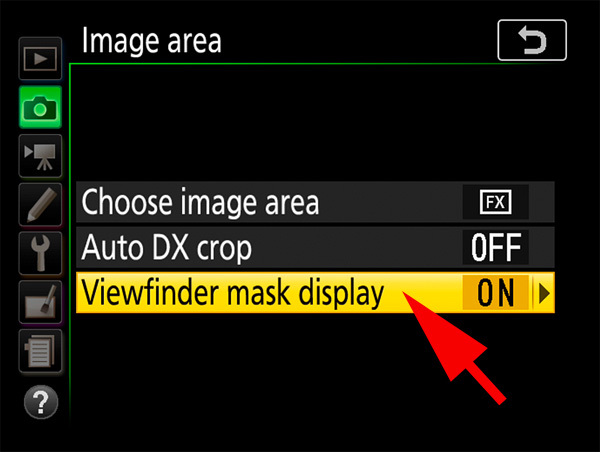 Look for an option called Viewfinder Mask Display and click it. Now, just turn it on. So, the bottom line with all of this is that cropping modes, while they don’t have any image quality advantage over cropping back home at the computer, can certainly help in other ways when you’re knocking out those wall-hangers in the field. 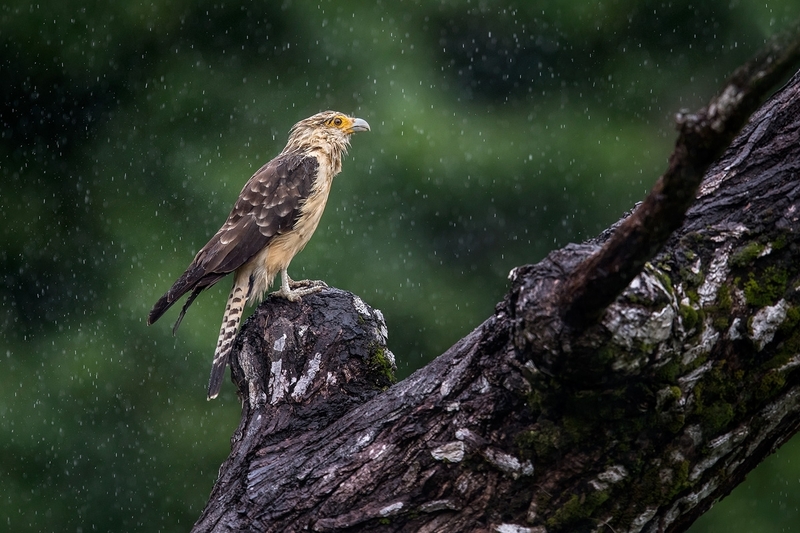 This entry was posted in Photoshop Tricks, Techniques, Using Your Gear, Wildlife. There are so many modes in a camera and for the perfect click you need to have all the information about those modes and crop mode is one of the important modes. 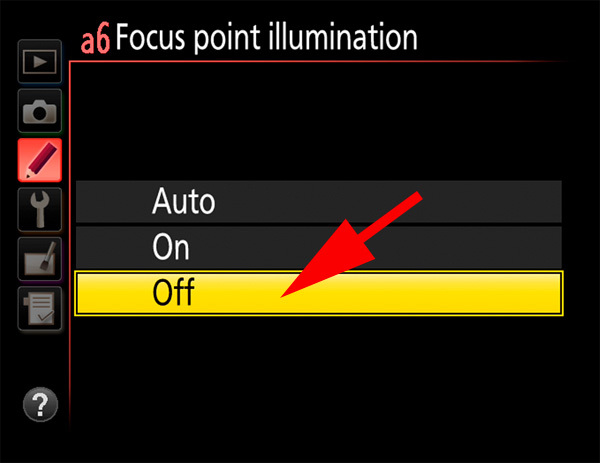 Crop Mask works on the D610: Under CUSTOM SETTING MENU – a AUTO FOCUS, go to: a4 AF POINT ILLUMINATION and just turn it off! Maybe an update on the article might help those 600 & 610 shooters who don’t read the comments section. I love this MASK OPTION. Thanks! I’ve updated the article. Actually, just got my Z6 and was playing with that yesterday! It’s a cool feature – nice not to have the crop border sometimes. To me, unless you are dealing with still photos there is too much going on where action is involved to worry about cropping, framing, zooming, or whatever. My choice is to even zoom out a bit so I capture more than I need. Then I can take my time in post to view the many different crop positions as well as zoom settings to get the end result that I am looking for. With the high resolution rate of today’s cameras nothing is lost or at least anything that the typical photo viewer will notice. .
My Dear Steve Perry..I am using a Nikon D 7100 Camera + NIKKOR 200-500mm. Super Telephoto Lens for my Wildlife Photography works. This Camera features two image areas for still images – DX format and 1.3x crop of DX. 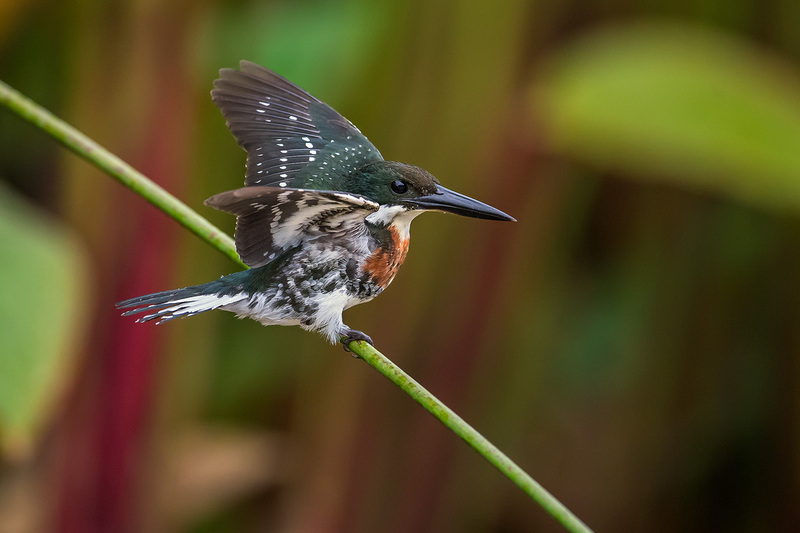 Now my question is if I use the 1.3x crop, will it give more capturing power ( double the focal length or any) when shooting moving subjects..like Birds and Mammals in the WILDS..? I want to get a very clear understanding from your Honor..Kindly guide me. Warm Regards. Sincerely yours – SUMANGALA RAJAPAKSE. Same magnification as the regular uncropped sensor, just cropped more. It’s like having a 1.8X crop instead of the normal 1.5X – but it’s still a crop so you still lose resolution. My Dear Steve Perry..Understood well. Respect. Thank you very much. Blessings and Warm Regards. Hey I just want to say thank you, Steve for this free and very informative article! I presume another downside of in- amera cropping is the increase in the effective focal length of the lens? So a faster shutter speed is required, and therefore less light, to prevent blur? Could compensate with higher ISO at the risk of a noisy image. Not really – it’s no different than had you used the same lens and went back home and cropped on the computer. If it was going to be pixel-level sharp at full frame, it’ll be like that in crop mode too. Also keep in mind that the focal length stays exactly the same regardless of the sensor or the sensor crop behind it – 300mm is 300mm and acts like 300mm. 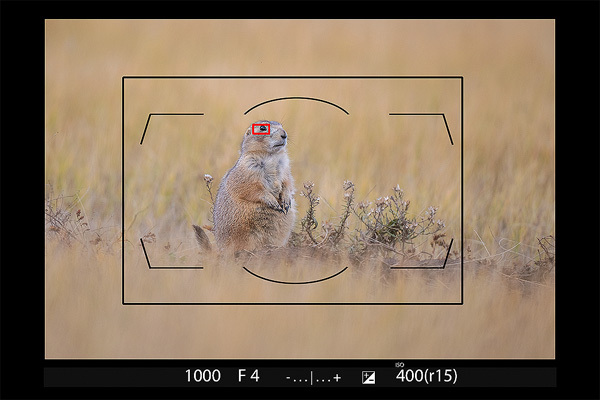 Only the Field Of View changes with a smaller sensor or crop. Note that in the image you mention, I did have a 1.4 TC attached 🙂 He was just a bit far away, so I had to use the TC and crop. When shooting in crop mode you will also pay a significant price in dynamic range, at least in the lab (http://www.photonstophotos.net/Charts/PDR.htm). Whether you would notice the difference in the field is another question. I will have to give it a try as gaining that extra frame on my D810 may be worth the trade off. Thanks Steve. Thanks Steve. I will be very interested in the upcoming article (…shhh…). I appreciate your hard work and outstanding instruction. Thanks – yeah, there are a quite a few downsides to cropping (like PDR, as you mention) that people just don’t realize. That’s why I started this article off the way I did 🙂 I feel so strongly about it that I’m calling the new one “The Cropping Epidemic” 😀 Probably out in early December. Steve, should this also go one step further to discuss aspect ratio. I print an 11X8.5 and constantly need to crop because none of the aspect ratio match this size. Ouch – yeah, as far as I know, none of Nikon’s cameras have that option. For that, you’d probably have to shoot 2:3 and just keep away from the edges when you compose. I may add that tidbit though – it’s a good point! 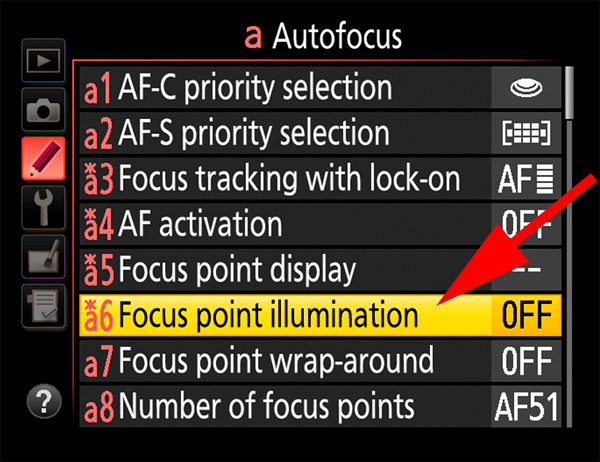 EDIT- I’ve added point #5 to for aspect ratio – thanks! Thanks Steve, I have used the Crop modes on my D5 occasionally, but more out of curiosity than anything else. I have found doing the lens to body dance with the D500 & D5 works for me. ( sports mostly) If I need crop/DX, I just grab the D500. But If I go out with out it and have just the D5…certainly crop mode is there as an option. Another good post. Always appreciate your insight. You’re doing it the right way 🙂 Crop modes are handy in-camera when you’re too far away, but if you can switch to a higher pixel density camera, that ALWAYS the best way to go. I used to do the D5/D500 swap all eh time (Now I use the D850 for a little more flexibility). Here is crop question for you in relation to loss of resolution . I am shooting predominantly landscapes and allow for 1 x 3 composition in camera on my D850 to than post process as a 1 x 3 format , it is my understanding that although cropping pixels away i am not doing so in the width of the full frame where pixel numbers remains the same , therefore would it be fair to conclude that I am not sacrificing resolution as you would with any other crop ratio ? Technically, any time you crop, you drop resolution. If you crop your D850 to a 1:3 ratio and look at the resolution, it’s no longer 46MP. You aren’t dropping any on the long side, just top and bottom. Not that it’s a bad thing – I do various aspect ratio crops all the time. The 8×10 format is one of my favorites, but I lose the sides of the frame. While I retain all the height, I lose the width and is does drop the overall MP total. You seem to have a knack of knowing which tips and techniques will benefit most the average (and not so average) photographer. I have learned much from your videos and e-books, and this latest offering will add to my knowledge base and enable me to get more out of my D750. Im so amazed with your page and your youtube channel! It is my inspiration. Im just starting photography, I would like to know what camera you used? I have a Nikon D5200, but I think its just basic and your photographs are so jaw dropping! Interesting and detailed presentation. I’ll lock in and assign a crop to my cameras. Very thankful for your willingness to share your knowledge and that you use Nikon! For those of us who shot 4×5 sheet film back in the day the 5:4 crop mode on the full-frame Nikons lets us compose using our preferred aspect ratio directly in the viewfinder Obviously this works best for static or near-static subjects. When I shoot moving subjects from a moving platform (at my age “moving platform” accurately describes me) I use the whole 2×3 frame to allow for straightening and cropping as you suggest. Love your books and videos – when can we expect the exposure one. I just finished working on the book for the day – hope to have it out sometime in January. Lots more to do, but it’s getting closer every day. It’s a big one, lots of tips and tricks inside. The bear in the article above was actually with my D4 in crop mode – and I’ve made a beautiful 16×20 for a client from it. You’d be surprised. Only as needed of course. Also, full disclosure, I very seldom used the crop mode in my D4 – only on a couple occasions where I was running low on memory. That probably isn’t as much of a concern anymore – you can get pretty good size XQD cards without breaking the back. I’m just amazed at what the D4 could do when cropped to DX! I have recently been using Nikons fish-eye zoom set to 8mm. A quirky lens but great fun. As the image is a circle at 8mm I set the image area to 24×24 – otherwise I am saving rather a lot of black pixels – very wasteful on the hard drive! Thanks for this iteresting article. That´s exactly what I have grasped, too. One (fifth) aspect to pros, maybe, is the better coverage of focus points on a smaller image area, correct? I thought about adding that, but didn’t because I figured that if you are far enough away to consider using crop mode, the AF spread isn’t an issue anyway. What is about lens focal length? If I switch to DX mode on my D850, does this mean that my 24-70 lens becomes 36-105? Hi Boris – The lens always stays the same focal length – it gives you the field of view of a longer lens, but still retains the characteristics of the actual focal length (DOF, etc). My Dear Steve Perry – Great of your works and presentations. Thank you very much . Also in terms of shooting speed and buffer is the choice of 14 bit or 12 bit files. Perhaps you could do a piece on this. As always, a well written article. You’ve given me a lot to think about. Also, I purchased your new video on Noise Reduction and really enjoyed it. It’s as if this was written for me- was just researching yesterday and wished you had a tutorial on this. Thanks so much for such valuable information! !